This magnificent barb is a worthy representative of its Group: it is agitated, gregarious and an excellent predator. These facets make all the charm of this fish, but will require some precautions. Check out all the tips for maintaining the Blackspot Barb in this sheet! How to feed the Dawkinsia? Omnivorous: all forms of food are accepted with plant supplements. What kind of behavior does the Dawkinsia have? The Blackspot Barb is very active and always on the move, but it remains peaceful. It is gregarious and must imperatively be kept with a shoal (make up your group with 1 male for 2 females). Who can live with the Dawkinsia? Community aquarium accepted but with species not too shy and big enough. In fact, smaller fish will serve as a meal. Also note that its restless temperament could hinder the calm fish. Also beware of fish like Guppy or fighters whose it could attack the long fins. However, this last behavior fades if the barbs are kept in sufficient numbers (the males will then concentrate more on the defense of their position in the hierarchy). How to breed the Dawkinsia? Its breeding is easy and sometimes occurs spontaneously. However, if you want more fry, you must dedicate a specially designed tank for this purpose. As spawning occurs in groups, the size of the breeding aquarium will depend on the size of the group (100 to 200 L or 26 to 52 gal). Place a protective grid at the bottom of the tank and enough thin-leafed plants (Taxiphyllum for example). The temperature will be 26°C or 79°F and the pH is 7. You can also dim the lights. Compose your breeding group with a few more females than males. 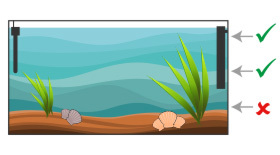 After spawning, remove the parents and the protective grill, then renew 50% of the water. Although this is not mandatory, you can treat eggs with methylene blue. The incubation lasts 48 hours. Fry food should be available at all times and water should be changed regularly. Which aquarium for the Dawkinsia? To resemble its original habitat, compose the substrate of sand, fine gravel and worn rocks of different sizes. Add some driftwood branches. Beware of possible damage to plants (prefer strong plants such as Anubias and well-secure them to their supports). Provide a large swimming area. Powerful filtration and frequent water changes (polluter fish). Note that it supports badly sudden changes in temperature and dirty water. Sexual maturity is reached at 1.5 years. 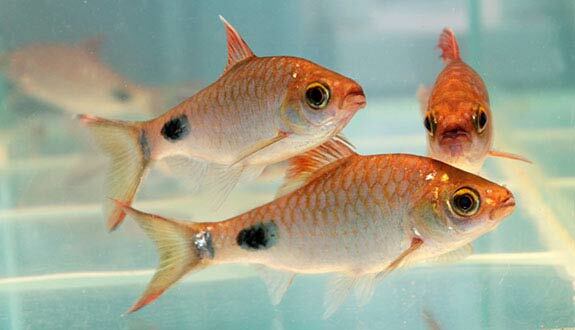 Young fish are not very colorful, and their colour appears only around 3 months. A distinct hierarchy will be visible in the shoal: the more they will be numerous and the more the group will be calm and stable.